Bone conduction technology delivers music through your cheekbones, ensuring ears remain completely open to hear ambient sounds One lucky winner will receive the Trekz Titanium Mini Headphones. I would give these to my grandson who loves to play online games. I would give this to my son whose always losing headphones. 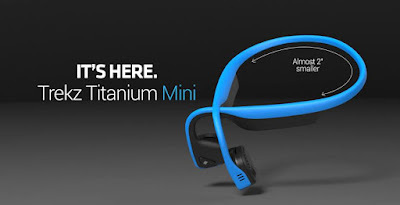 I would give these awesome head phones to my daughter so that she can use them either while she is working out at the gym, or doing her morning run. I would totally gift these to myself! They look awesome! I would give them to my oldest daughter. During the weekends, my husband loves to cook and listens to his music wearing headphones that cover his ears. These would be perfect for my husband for enjoying his music while cooking in the kitchen and he'll still be able to hear my kids and myself. I would give them to my girlfriend. I would give these to my grandson, he is asking for headphones for Christmas. I would keep them! :) I run every morning so it's great to have a spare pair charged and ready to go at all times. thanks! I would keep these for myself because earbuds always fall out of my ears so these would be better. I'd keep these for myself because I could use some new headphones. I would give these to my daughter. Thank you for the giveaway. Happy Holidays. My friend because he loves music. I would keep them for when I work out. I would keep them for myself, they are perfect for the gym and grocery shopping. I would give these to my friend Yan so she could watch her shows on her phone and keep her ears open. I would use these for myself. I enjoy watching ASMR videos online- the best way to experience the sounds in these videos is to use a pair of good earphones to get the "surround sound"
I'd give these to my son for his upcoming birthday. if i won, i would give these to myself. i am working out each morning and i would love to use these while i workout. I would use them myself on my daily walks. I would probably give them to my son, but I might be tempted to keep them for myself. Not to be selfish...I would want them for myself! I have ruined a couple headphones lately and could really use these. I would give these to my nephew, because he has helped me out a lot recently, and because he could wear these while running or exercising. He would be safer as he could still hear the outside noises that he needs to. I would probably give these to my husband because he can't hear anything around him when he has his earphones on. I would give these to my daughter on the condition that i can borrow them.... a lot. I would give to my nephew who loves music. He is an audiophile nut. Who would you give these to if you won and why? I would give them to a random person on the street just for the heck of it. I would give these to my teenage nephew, he plays guitar in a band ! I would give these to my oldest son. He works out a lot and his ear buds just broke.